There are certain visible trends in school education globally, at least in developing countries. One, increasing role of education - Education has become a crucial factor determining the status and growth of an individual. Economists broadly categorize jobs into three types – abstract, manual and routine. Abstract jobs are high skilled jobs or those which require lots of thinking. Manual jobs are those which involve repetitive actions like assembly line workers. These tasks are relatively easy to automate. Routine tasks are those like house maids, gardeners etc., which can’t be easily automated, at least as of today. This has resulted in three trends – (i) one needs to have good education and skills to be able to get an abstract job. (ii) With the advent of technology, the proportion of manual jobs is decreasing due to automation. Evidence says that at times, like in the recent the recent US recession, the worst hit people were those doing manual tasks, and also it took them more time to recover. [i] So, the best bet for someone who doesn’t want to be at the level of doing routine jobs is to jump to abstract jobs, which requires education, thereby making education an important factor. Two, increase in demand for education – The increasing need for education is reflected in its increasing demand. With raising incomes, there is an emerging and aspiring section of people, who want good education to their children. Three, failure of public systems - Government schools aren’t working well (at least perceived to be so) and aren’t able to fulfill parents’ needs. Four, increasing enrolments in private schools – The increase in need for education to proposer, coupled with its increased demand and failure of public systems resulted in increasing shift towards private systems. It is perceived that going to a private school may not result in success, but going to a government school will almost ensure failure. Private schools also offer variety; English education and other aspects which parents find attractive and valuable. In India, the percentage of rural children enrolled in private schools in the age of 6-15 has increased from 18.7% in 2006 to 30.8% in 2014. In some states like Uttar Pradesh (52.8%), Rajasthan (43.5%), Haryana (53.6%) and Punjab (49.3%), this share is as high as 50%, which is a significant proportion of the school going children. These trends have raised questions on the efficacy, funding and governance systems of school education systems. School Vouchers is the prominent among them. In a traditional public education system; government sets up schools, recruits teachers, provides necessary infrastructure and looks after other related aspects. Parents send their children to these government schools at free of cost. Broadly, this means that government funds schools. School Voucher system funds students and not schools. The idea is that instead of funding schools, government could give that money (per-child expenditure) to students in the form of a voucher, who would then use it to study in school of their choice. There are five broad arguments in favour of this approach. The fundamental argument for voucher system is that, if basic education is the right of a child and if it is government’s duty to ensure that, why should students be forced to exercise their rights only through one particular type of schools (public schools)? Why shouldn’t they avail their right in other forms (private schools)? Two, the current education system is skewed towards the rich. People with higher incomes are sending their kids to schools of their choice, while the poor are being forced to often attend the inefficient schools. Voucher system can bridge this gap to an extent. Three, the poor today are facing extreme financial stress at times due to out of pocket expenditure on private education. Voucher system would ease this financial stress of these families. Four, public school systems are marred by weak incentives to be accountable and perform. The voucher system will induce competition between private schools to enroll students (who are potential clients), thereby pressurizing them to perform well. This would also indirectly pressurize public schools to improve themselves in order to retain students. Five, competition would also result in variety, and parents can choose the school of their choice, instead of being forced to attend only the school in their neighbourhood. We discussed the reference frames in debates in the governance theme (3.4). This section would be using these to identify the cause of difference in the arguments below. Some concerns are philosophical, some are about the possible negative effects and some concerns are skepticism about the success of the voucher approach and its implementation. I. Vouchers help private individuals prosper - The opponents of voucher scheme question the rationale to invest money on private schools. Some argue that it would be equivalent to helping private people to earn profits and hence shouldn’t be so. The proponents of voucher scheme argue that, money isn’t being given away for free to private individuals. The same money which would have otherwise been spent on the students is being given to students, who are further using it to get better educational opportunities. If students are benefiting from it, then it shouldn’t matter. This is a debate about outcome vs. agent of outcome – Outcomes should matter and not the nature of schools. It is a difference in framework of conception of systems. II. Vouchers are not a panacea – The opponents of voucher scheme argue that vouchers are not a panacea to the ills of our school education system. Elsewhere in the world, public education system always had a role. The proponents of voucher scheme argue that, vouchers needn’t be a panacea but one of the possible approaches to better systems, even if it is marginal. This difference is due difference in perception of necessary vs. sufficient conditions and panacea vs. marginal solution. III. Improve public schools to help the poor instead of private schools – The opponents of voucher system argue that government schools should be improved to help the poor and that using other approaches is evading their responsibility. The proponents of voucher scheme argue that there is a difference between public provision of goods and public funding of goods. Government’s job is to ensure outcomes; it can do either public provision (govt. schools) or public funding (govt. funds but other provide services). Government can also ensure same outcomes even if it doesn’t directly provide goods. Parents primarily decide whether their kids are receiving good education and their choice should be respected. Satisfying parents is the other form of performing government’s duty. Voucher system isn’t evading responsibility but actually giving chance to these parents to go for choices of their satisfaction; thus voucher system is actually being responsible towards education and not evading of responsibility. Giving vouchers doesn’t mean that governments should stop managing government schools and it can work on improving public schools in parallel. IV. Private schools will become a monopoly and kill all government schools – Opponents of voucher system argue that there will be mass exodus of students from government schools to private schools, leaving all government schools empty. This will kill all government schools in long run, thereby making private schools as dominant players. Proponents of voucher system argue that, if mass exodus happens, it reflects the quality of public schools in the perspective of parents. The argument of mass exodus acknowledges the failure of public schools, and hence it is a sin to force students to remain in these schools for the sake of protecting them. The primary responsibility should be towards children and not the school. If parents are satisfied at the end of the day, why should other aspects matter? This difference is again due to difference due to outcome vs. agent of outcome reference frames. In this context, it is instructional to look at data on public vs. private share in voucher systems. In India, Center for Civil Society, a Delhi based think-tank piloted school voucher system in Delhi in 68 wards. They advertised for 480 vouchers, each costing Rs.3600/- per year, which will be selected based on lottery. 1.2 lakh parents applied for school vouchers. The share of voucher funded schools in Denmark (10%) to that of Holland (70%) and the pilot experiment in Delhi shows that the possible difference in the private vs. public share in voucher contexts is wide and difficult to predict. However, the argument of voucher proponents is that, this share shouldn’t matter, as it reflects the preferences of public. A lower share of public schools only reflects their quality. V. Social stratification – Opponents argue that voucher schemes lead to social stratification in schools – rich attending a particular type of schools and the poor attending a particular type of schools. This can especially happen, if people are allowed to top-up the vouchers with their own money, which will again lead to unequal ability to spend, which defeats the purpose of vouchers. Such stratification can also limit the gains of peer-effects (interaction of better off kids with others). The opponents argue (i) though the unequal ability to spend may remain if parents can top-up their vouchers, vouchers at least gives minimum ability to spend. Without vouchers, the difference is between zero and ‘x’, and with vouchers it is reduced and parents have minimum ability. (ii) Social stratification is anyways present even today, even without vouchers, with poor opting for government schools and rich opting for private schools and hence it isn’t a new concern, if at all it is so. Evidence from Chile[iii] suggests that middle class exodus from public schools was part of the private sector growth and Chile has highest levels of school-level socio economic stratification by socioeconomic status in OECD countries[iv]. Evidence from Sweden suggests that the effect of choice on segregation is relatively low[v]. This suggests that the design of vouchers and context seems to determine the extent of stratification. In Indian context, RTE (2009) mandates reservation of 25% of seats to kids of Economically Weaker Sections (EWS), thus capping the possibility of extreme stratification. VI. Vouchers can’t cover all geographical areas – Skeptics of voucher system argue that vouchers may not be a possible solution for all contexts, especially rural areas. Proponents of voucher system argue (i) there are low cost schools even in rural areas today. Even there aren’t any, with the introduction of vouchers; there is an incentive for local residents to build a school, since the money is ensured. (ii) Students can always attend the government schools, in the absence of a private school, which is equivalent to the status quo. 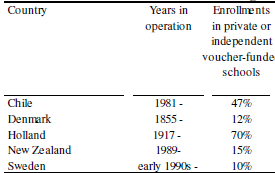 (iii) Vouchers may not be feasible in all geographical contexts but at least they should be allowed to function wherever they can, as decided by the market. Non feasibility in certain contexts can’t be a reason to stop it from operating in areas where it can. If necessary, schools gaining students above certain number can be asked to setup schools in these villages, and other possible solutions can be found out. One can see that there are many low-cost private schools charging minimal amounts even today. The extent of new schools depends on the norms and the constraints in their entry. VI. Parents don’t have information about schools and learning – Parents can’t choose – Skeptics and opponents argue that there are information asymmetries in education and that parents can’t differentiate between good and bad schools. This might lead to bad choices and also exploitation. Proponents argue that the definition of good and bad and associated preferences are subjective and are best judged by parents. If there are information asymmetries which can possibly lead to exploitation, then the solution is to provide information to parents through rankings and assessments of schools, rather than denying vouchers for this reason. There are information asymmetries in many other sectors too; government’s role is to provide information and ensure certifications but not to stop. Some evidence can help us understand this better. The surveys in UP and Tanazania suggests that there is gap between perceptions and reality. If that is so and if parents can’t accurately judge, why are they shifting their kids to private schools? Possibly, parents cannot accurately say if their kids know addition or division but they can differentiate the quality on a macro level. The high correlation between performance of schools and their beliefs also suggests this. Overall, this suggests that there is need for better information provision on quality of schools, to enable better decision making. It is argued that there are some potential issues with conducting assessments and sharing such information. The assessments can become high stake because schools' business depends on these scores, which might result in teaching to the test and also manipulation etc. As discussed earlier, administering credible assessments is going to be the key here. VII. Schools may spend all money on infrastructure and not invest on learning – Skeptics and opponents argue that schools may end up spending money on infrastructure, decorations etc., making it attractive for parents but not invest on learning aspects. It is a concern since investing on infrastructure etc. may not result in learning and parents can be easily misled. Proponents argue that, the demand of quality from parents restrict the private schools’ temptation to spend on other aspects, like in other sectors where companies spend all their profits on marketing. An interesting experiment [x] was done in Pakistan to see what happens if schools get grants. In one group of villages, grant was given only to one school in a village and in the other group, grants were given to all schools, and the third group which served as a control group received no grants. After one year, it was found that the schools in first group, where only school in each village received money, the enrolments increased and thus the revenue too but there was no improvement in learning outcomes. In the second group of villages, where all schools in the village received grant, there wasn’t much change in enrolments but the gain in learning outcomes was significant in this group. This suggests that if schools have money and if there is competition, they have the capability to improve. On the other hand, the lack of competition can lead to investments but not necessarily lead to outcomes. This strongly suggests the need to have an ecosystem ensuring competition. In order to prevent asymmetric information flows in cases where there isn’t enough competition; sharing information on quality of schools can be useful. VIII. If government can’t run public schools, how can we expect them to manage private schools? – Skeptics and opponents argue that if doesn’t have the capacity to run government schools, what is the guarantee that it can manage private schools? We discussed about the state capacity, the capability to implement policies in the theme on governance. The appropriate question to ask here is – what can the government do better? - Running public private schools or managing private schools? The inability to run government schools isn’t equivalent to inability to manage or regulate private schools. The skills and capability required to do both are different. IX. Private schools can collude with governments or may not listen to them –Skeptics and opponents argue that private schools of powerful businessmen can collude with governments and violate rules, and not listen to them when necessary. Proponents argue that this is a concern in every sector and the solution to this to demand better transparency and norms than rejecting the idea altogether. X. Local goondas can extract vouchers from parents – Skeptics and opponents argue that local strong men and goondas can extract vouchers from the poor, forcing them to attend their own schools. Proponents argue that rule of law is an issue across sectors and again the solution to this is to demand better rule of law rather than rejecting the idea, and also that such cases may not be prevalent in all contexts. [iv] Valenzuela, J.P., C. Bellei, and D. de los Rios, “Segregacion escolar en Chile ,” in Martinic, S. and G. Elacqua, eds., Fin de Ciclo?, Santiago: Unesco, 2010.